Eamon Collins was beaten and stabbed in 1999 while out walking his dogs. 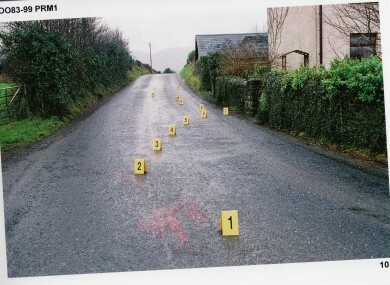 The scene of Collins' murder. EAMON COLLINS WAS killed in 1999, and now, 15 years after his death, the PSNI is making a fresh appeal for information – and says it has made a DNA breakthrough. Detectives from Serious Crime Branch are investigating the murder of Collins in Newry in January 1999. Eamon Collins was 45 years of age when he was found beaten and stabbed at 6am on 27 January 1999 at Dorans Hill, a country road a short distance from his home in the Barcroft estate. He was married with four children. Police believe he was deliberately struck by a car while out for an early morning walk with his dogs, before being beaten and stabbed. Detectives have today announced they have a DNA profile from the scene. They are also appealing for information about the car used in the attack, a white Hyundai Pony, and a hunting knife, part of which has been recovered from the murder scene. Photos of these can be found in the slideshow below. We have a DNA profile from the scene so we are not without hope that one of the killer gang will be identified through the course of police inquiries. “I would appeal to anyone who can provide information about the knife, the car or those involved in this brutal killing to contact us,” said Det Montgomery. It is 15 years since Eamon Collins was murdered. Much has happened in the intervening years in terms of politics, policing and allegiances. I would ask those with information about Mr Collins’ murder, particularly those in the Barcroft estate, to think again about the awfulness of what happened and about his family. It is never too late to come forward. Anyone with information can contact detectives on 02890 700 727 or 07585 228 283. Information can be given anonymously to the independent charity Crimestoppers on 0800 555 111. Email “Eamon Collins was killed in 1999 - now there's a DNA breakthrough ”. Feedback on “Eamon Collins was killed in 1999 - now there's a DNA breakthrough ”.